Readers are introduced to the unlikeable Scrooge, a businessman living in 19th century London. It is Christmas Eve, and Scrooge has no time for Christmas or anyone who celebrates. After criticising and threatening everyone he encounters at his counting house, he retires to his gloomy apartments. There he unexpectedly meets the ghost of his partner, Jacob Marley, who died seven years ago on Christmas Eve. Marley announces that Scrooge will be visited by three ghosts. The outline of chapter one is signficant. Scrooge has hostile interactions with four different individuals in the second part of Stave 1. These interactions set the outline for Staves 2, 3, and 4. When Scrooge arrives in his apartment, he encounters five supernatural phenomenon that put him on edge. 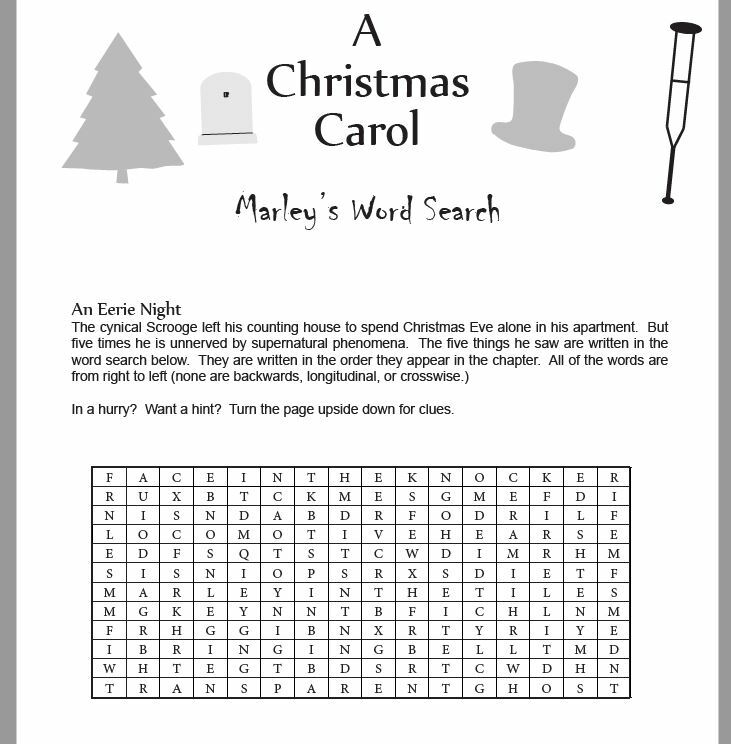 Use Marley's Word Search from The Christmas Carol Unit Study to discover the five freaky phenomenon Scrooge encountered before his discussion with his ghostly partner. While there are many passages in Stave 1 that could be used for oral reading, students are encouraged to practice a dramatic reading of the sixth paragraph for fun. In stave 1 we examine several model sentences that Dickens wrote using parallel participles, parallel clauses, and symbolism in names. Students are given a challenge to imitate those model sentences to develop their own fictitious characters. Students practice identifying simples sentences, complex sentences, and clauses with some of the quotes from the conversation between Marley and Scrooge. Scrooge falls asleep and awakens in the middle of the night as a mysterious hand draws back his bed curtain. He meets the ghost of Christmas Past who takes him to visit five different Christmas scenes from Scrooge's history. As Scrooge revisits a lonely and painful past, he becomes aware of the harsh words he spoke to others in his counting house earlier that day. The outline is developed to contrast the encounters in Stave 1 with the visitations in Stave 2. They do not follow the same chronological order. End of Chapter: He "extinguishes" the spirit by covering its light with its cap. He falls asleep in his own bed. Students are challenged to write epitaphs and limericks through the story. Epitaphs were introduced in Stave 1. We will see the limericks again in Stave 3 and 5. 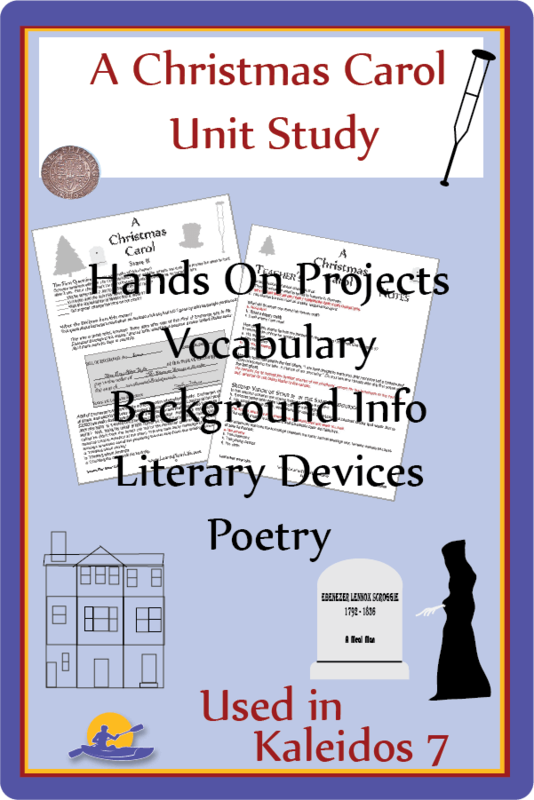 Lesson Plans are from our 84 page "Christmas Carol Unit Study." See below. Scrooge finds the pleasant ghost of Christmas Present waiting in his living room. He takes Scrooge on a journey where they can see people celebrating this Christmas Day. He observes Bob Cratchit's family, is touched by his ill son Tiny Tim, and surprised to find Cratchit's wife considers Scrooge the ogre of the family. Later he sees his nephew Fred entertaining his Christmas visitors, and hears how they think of him. As the night proceeds and the spirit ages, he observes the spirit touch the lives of many poor and ill people with compassion. At the end, he sees two emanciated children beneath the spirit's robe. These are Want and Ignorance. Horrified by their existence, he asks the spirit what resources there might be for them. The spirit reminds him of his own words to the charity collectors, "Are there no prisons? Are there no workhouses?" The second spirit disappears and Scrooge sees the final, gloomy spirit moving towards him. In Stave III students are challenged by the listing style of writing which Dickens uses occasionally. The use a model of his description of a store on Christmas Eve, and use that style to describe a different scene of another business or place. Students who like to put their artistic skills to use are challenged to represent one of the spirits based on the description in the book, not in movies or plays. Dicken's role as a social reformer is discussed. 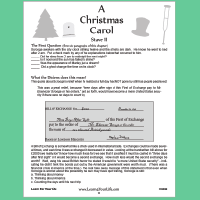 Students analyze how the plot of "A Christmas Carol" contributed to social reform. 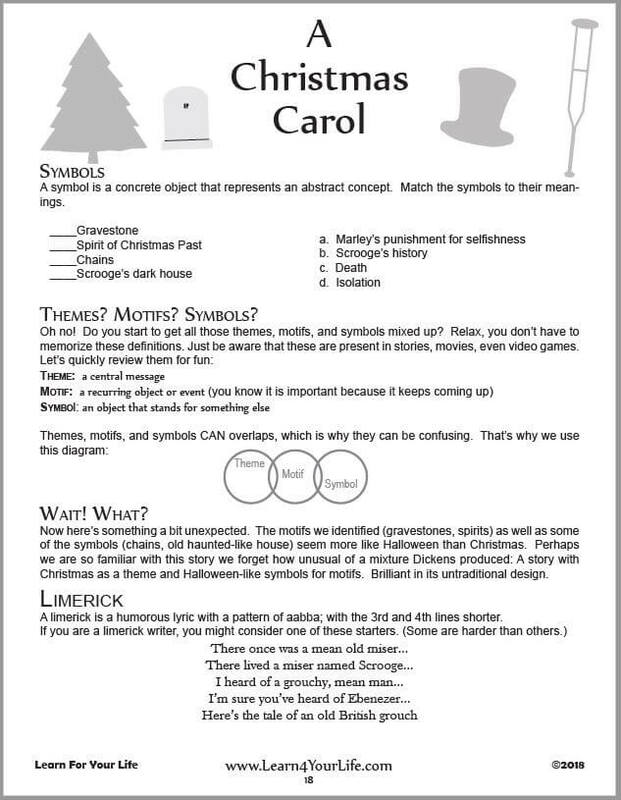 Influence of "A Christmas Carol"
Devise a list of ways that we can see "A Christmas Carol" has influence our perception of Christmas. Go on a hunt to find Dickens-related imagery in the current holiday season. How is it different? How is it similar? The eerie ghost of Christmas Yet To Come takes Scrooge sight-seeing, as did the previous two spirits. This time they view scenes regarding the death of an unknown man. Suspicious that it is himself, he asks the silent spirit who continues to take him to different places. He sees businessmen talking about going to a funeral of someone who had no friends. He views a pauper's shop where the cleaning lady and undertaker have hard-heartedly stolen from the deceased. He observes a couple who are relieved that the dead man no longer threatens their financial ruin. He begs the spirit to show someone who cares about the death, and he sees the Cratchit family mourning the death of Tiny Tim. 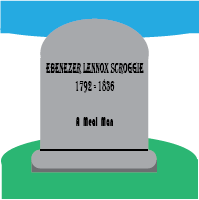 When Scrooge begs the voiceless spirit to tell him who the dead man was lying on the bed, he takes him to a poorly kept cemetery, and there Scrooge sees his own name upon the tombstone. He pleads for another chance to make amends for his ways and to share the spirit of Christmas with others. He clutches the skeletal hand of the spirit who tries to shake him off but he clutches harder and begs more ferverently. The cloak of the spirit disappears and Scrooge finds himself in his bedroom clutching the bedpost instead of the arm. Have fun letting people use their voices to emphasize the phrases in the first two paragraphs of the story. Personfication is an abstract concept represented by a person. 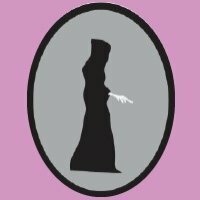 Our Stave 4 quotes from the bettling shop to examine attitudes and colloquialism as the four characters go through the deceased man's belongs in a vulture-like fashion. For Stave 4, two descriptions of the spirit are used as model sentences. One demonstrates the placement of adjectives for emphasis, and the other uses an amplified style for emphasis. Students are encouraged to write their own sentences with these two shorts sentences as models. After waking up in his own bedroom, Scrooge breaks out into joy to find he is still alive. He calls to a boy on the street who tells him it is Christmas Day. Unlike his former self, he is pleasant with the child, and sends him to buy the prized turkey at the butcher shop as a joke on Bob Cratchit. He laughs and dances, go outs on the streets and talks with others. He meets the charity collector he dissed the day before, promises a large donation to help the poor, and invites the man to visit him. He enjoys the afternoon with his nephew Fred and his guests. The next morning he pretends to be stern when Bob Cratchit arrives late, but then promises him a raise and says they will sit down in the afternoon to talk about how he can help him and his family improve their situation. The story concludes by saying he became a second father to Tiny Tim, "a good of a master as the old city knew," and knew how to "keep Christmas well." 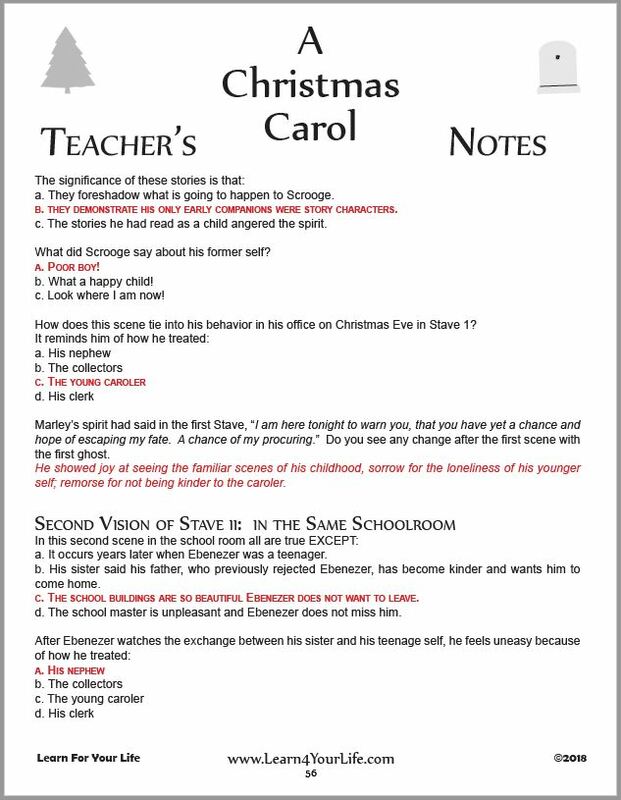 Find as many references to the change in Scrooge that are listed in Stave 5. We found twenty changes. The quotes from Stave 5 demonstrate the contrast between Scrooge in the first stave and the fifth stave. Students are given a chance to consider both the celebration of holidays and the care of other people as they respond to Dicken's message. 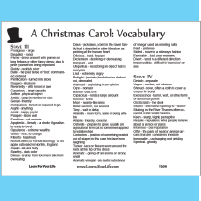 More pages on "A Christmas Carol" by Charles Dickens. Full 84 Page Unit enlivens your reading with hauntingly pertinent questions, info, & activities.